Backup manager for all your important data with this top performing data backup and recovery program. Complete security for all your important data! Awarded Best Backup Software by Computer Shopper, WinBackup 2.0 Standard is now the obvious choice for home and small office users. With shortcuts to over a 100 of the most popular applications, WinBackup 2.0 Standard makes it possible to easily and quickly backup emails, address books, bookmarks, digital images, financial documents and other records at the click of a button. Complete security for all your important data with this top performing data backup and recovery program. With so many threats to the integrity of your system and to the security of your data, regular backup of the information that’s important to you has never been more important. And now, it has never been easier to do! WinBackup 2.0 Standard is a comprehensive data backup and recovery tool that secures your valuable data in just a few short minutes. Via a Windows familiar, intuitive new graphical interface that PC World called "exceptionally simple to use", WinBackup 2.0 Standard helps you set up and run regular backups in your existing environment. It’s shortcuts to over 100 applications means that all your files, spreadsheets, emails, address books and digital imagery can be stored and retrieved easily, whenever you need them, in a few short clicks. This efficient and reliable tool also ensures full data consistency and integrity, without compromising performance. What that means for you is full protection of everything that is important to you. Complete peace of mind while saving you both time and money. Effortless backup and data retrieval in one complete software tool. WinBackup 2.0 offers a built in Outlook Agent that speedily browses and searches for specific emails and stores and retrieves them. The fastest Backup product yet! WinBackup 2.0 uses proprietary technology that delivers a backup and recovery management system that is the fastest on the market. Much more performance for your money! 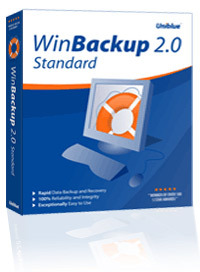 WinBackup 2.0 Standard version gives you more features that other products only offer at business level. Imagine what our professional package can do! The powerful media features within WinBackup 2.0 let you backup data from any notebook or desktop, to any media of your choice, while ensuring that all data and applications are fully recoverable. WinBackup 2.0 gives you fully reliable data protection should something go wrong with your system. This product does in fact offer all the major features for a tool like this. Why we chose this one (and use it) is because it is so fast and easy to backup only the data that is truly important. Speed has been the major barrier for us regularly backing up, this has removed that barrier!